It’s taken me my whole life to pinpoint what type of guy I like. And I still flip flop my preferences on a regular basis. Luckily, choosing a style of veggies I like comes much easier. Growing up, my mom always told me veggies were healthy, and boys, well, not so much. So I guess I’m doing alright. Probably my all time favorite cooking method is roasting (though this is subject to change from time to time as well). The oven-baked style allows veggies like onions and tomatoes to caramelize, drawing out the sweetness hiding within them. It’s this caramelization that allows these tacos to remain simple, utilizing flavor from a heavy dose of golden garlic rather than a cabinet full of spices or herbs. (Which is not to say you couldn’t incorporate those too if you so desired.) Here, the veggies are allowed to fully be the star of these tacos, with the roasting effects allowing them to uphold this title. Roasted veggies and tacos are both favorites of mine in the summer, so it’s only logical to put the two together. 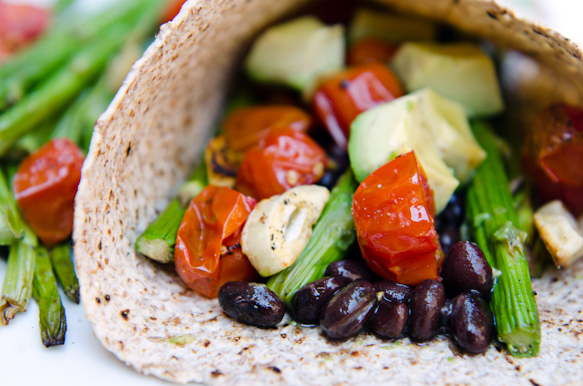 And don’t forget the avocado, my other favorite ingredient in this recipe. That’s one fly guy I’ll never change my mind about. Preheat oven 400F. Line large baking sheet with aluminum foil. Add asparagus, garlic, and tomatoes to sheet and toss with olive oil. Season with salt and pepper. Bake 10-12 minutes, stirring halfway, or until asparagus are tender and tomatoes are soft and bursting their juices. In the last 5 minutes, wrap taco shells in aluminum foil and heat in oven. 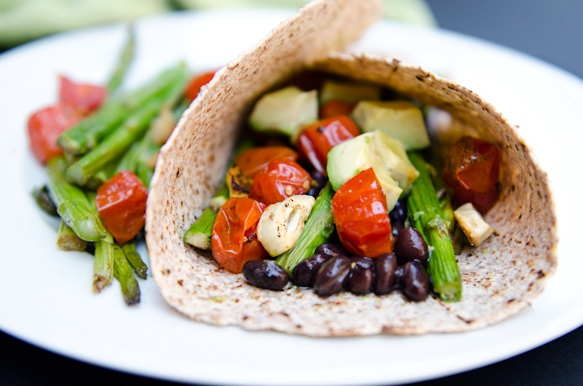 Layer taco shells with beans, asparagus, tomatoes and garlic. Top with avocado, and hot sauce, if desired. Serve. *These work best with thin spears. If you only have fatter asparagus on hand, simply cook them 2 minutes or so in the oven prior to adding the tomatoes. I’ve still not chosen my type of guy, good thing I don’t have to… anyway, these are really beautiful – you create such wonderfully crisp images.